Google Plus, the search giant’s latest try at social media, seems to be taking off. I’m not going to try to explain Google Plus here. If you need an introduction to it a couple of good ones are Google’s interactive tutorial and and Paul Boutin’s clear description of the basics. This post is a look at the available options for using Plus on a mobile device. 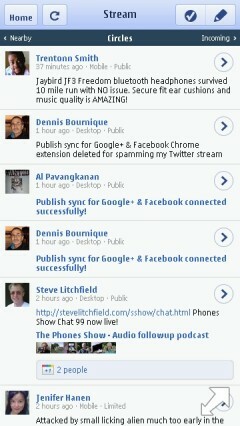 The richest Google Plus experience is with the official Android app which requires Android 2.1 or latter. Almost as good is the iOS app for iPhone, iPad and iPod Touch running iOS 4.0 or latter. 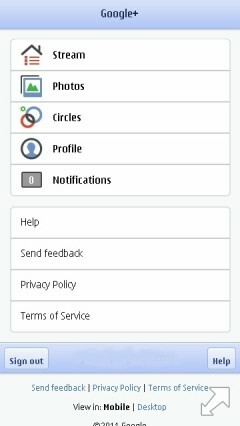 Available for Android phones (2.1+). Available for iPhone and iPod Touch (iOS 4+). Access the web app by going to google.com/+ on an Android device (1.5+) or iPhone and iPod Touch (iOS 3+). Access the web app by going to google.com/+ on a BlackBerry (6.0+), Nokia/Symbian, or Windows Mobile device. *Note: Location support may vary based on your device. However, the only unsupported combination that I found useful was using the Rich Mobile version in the Symbian^3 and WebOS browsers. This entry was posted in Social Networking and tagged bada, Google Plus, Myriad, Symbian, WebOS by Dennis Bournique. Bookmark the permalink.